Image caption Olive Boar was "always very active"
A combination of "good genetics and good luck" helped Britain's oldest person live until 113, according to her son. 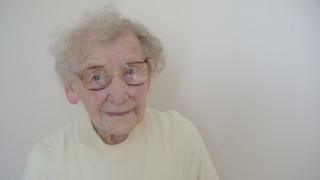 Olive Boar, who was born in September 1904, died on 28 August at a care home in Felixstowe, Suffolk, as first reported by the Ipswich Star. She was considered to be the country's oldest person in the rankings by the Gerontology Research Group. Robin Boar, 73, said his mother was "always very active". He said: "To see her doing nothing was very unusual. She would always be knitting, cooking, cleaning. "Her health, and her mental health in particular, were good until the end." Image caption Olive Boar's son Robin said her health was "good right until the end"
Mr Boar, who has a brother, Colin, 82, said his mother was born in Ipswich and had married his father Claude in 1932. He said the couple bought a house in 1935 for about £300 to £400, and that was where Mrs Boar lived until she was 108 - even on her own after her husband died in 1979. Mr Boar, who lives in Hertfordshire, said his mother was one of eight children and her parents lived into their 90s. Her last remaining sister will be 102 next week. He said his mother, who leaves five grandchildren and 11 great-grandchildren, spoke little about the two world wars, never had an automatic washing machine or central heating, did not own a passport and had never been abroad. Mr Boar said she was "very caring", "strong-willed" and would "always help anybody". "I will miss her," he said. But he said the fact she lived until 113 was "incredible".